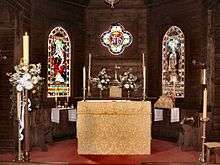 An altar is any structure upon which offerings such as sacrifices are made for religious purposes, and by extension the 'Holy table' of post-reformation Anglican churches. 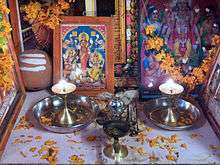 Altars are usually found at shrines, and they can be located in temples, churches and other places of worship. Today they are used particularly in Christianity, Buddhism, Hinduism, Shinto, Taoism, as well as in Neopaganism and Ceremonial Magic. Judaism used such a structure until the destruction of the Second Temple. Many historical faiths also made use of them, including Greek and Norse religion. Altars (Hebrew: מזבח‎‎, mizbe'ah, "a place of slaughter or sacrifice") in the Hebrew Bible were typically made of earth  or unwrought stone. Altars were generally erected in conspicuous places. The first altar recorded in the Hebrew Bible is that erected by Noah. Altars were erected by Abraham, by Isaac, by Jacob, and by Moses, (Adonai-nissi). The word "altar", in Greek θυσιαστήριον (see:θυσία), appears twenty-four times in the New Testament. Significantly, Hebrews 13:10  shows Christians having an altar of which those who did not believe in Jesus could not partake, a reference to the eternal, once-for-all sacrifice of Jesus Christ, thus fulfilling the sacrificial laws of the Old Testament. In Catholic and Orthodox Christian theology, the Eucharist is a re-presentation, in the literal sense of the one sacrifice being made "present again". 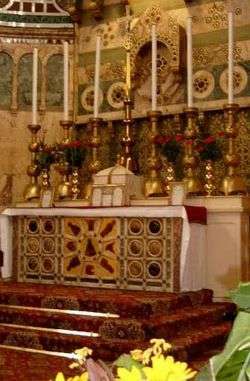 Hence, the table upon which the Eucharist is consecrated is called an altar. Altars occupy a prominent place in the sanctuaries of all churches of the Catholic Church, Eastern Orthodoxy, Oriental Orthodoxy, the Assyrian Church of the East, and the Ancient Church of the East, and in most Anglican and Lutheran churches. They are also found in a minority of other Protestant worship places, though the term "communion table", which avoids the sacrificial connotations of an altar, is often preferred. The altar plays a central role in the celebration of the Eucharist, which takes place at the altar on which the bread and the wine for consecration are placed. 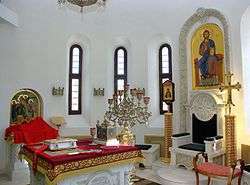 The area around the altar is seen as endowed with greater holiness, and is usually physically distinguished from the rest of the church, whether by a permanent structure such as an iconostasis, a rood screen or altar rails, by a curtain that can be closed at more solemn moments of the liturgy, as in the Armenian Apostolic Church and Armenian Catholic Church, or simply by the general architectural layout. The altar is often on a higher elevation than the rest of the church. In Reformed and Anabaptist churches, a table, often called a "communion table", serves an analogous function. In some colloquial usage, the word "altar" is used to denote the altar rail also, although this usage is technically incorrect. 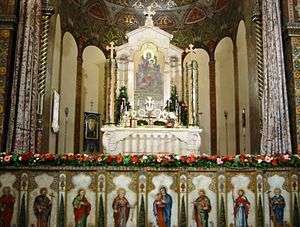 Churches generally have a single altar, although in the West, as a result of the former abandonment of concelebration of Mass, so that priests always celebrated Mass individually, larger churches have had one or more side chapels, each with its own altar. 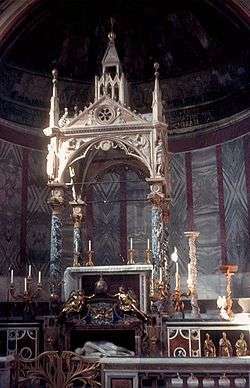 The main altar was also referred to as the "high altar". Since the revival of concelebration in the West, the Roman Missal recommends that in new churches there should be only one altar, "which in the gathering of the faithful will signify the one Christ and the one Eucharist of the Church." 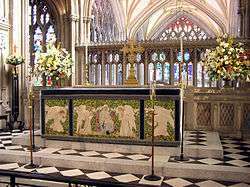 But most Western churches of an earlier period, whether Roman Catholic or Anglican, may have a high altar in the main body of the church, with one or more adjoining chapels, each with its own altar, at which the Eucharist may be celebrated on weekdays. 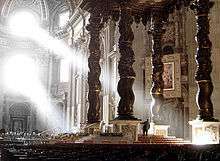 Most rubrics, even in books of the seventeenth century and later, such as the Pontificale Romanum, continued to envisage the altar as free-standing. The rite of the Dedication of the Church  continued to presume that the officiating Bishop could circle the altar during the consecration of the church and its altar. Despite this, with the increase in the size and importance of the reredos, most altars were built against the wall or barely separated from it. 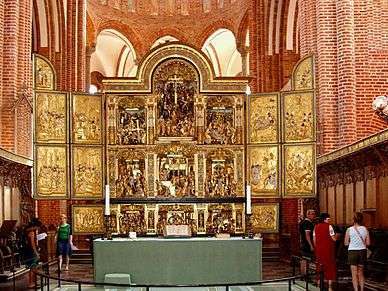 Movable altars include the free-standing wooden tables without altar stone, placed in the choir away from the east wall, favoured by churches that adhered to the Protestant Reformation. Altars that not only can be moved but are repeatedly moved are found in Protestant churches that do not focus worship on the Eucharist, celebrating it rarely. Both Catholics and Protestants celebrate the Eucharist at such altars outside of churches and chapels, as outdoors or in an auditorium. Altar at the Jesus Church in Valby, Copenhagen. A wide variety of altars exist in various Protestant denominations. 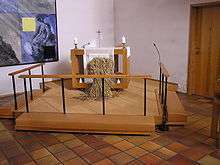 Some Churches, such as the Lutheran, have altars very similar to Anglican or Catholic ones keeping with their more sacramental understanding of the Lord's Supper. In Calvinist churches from Reformed, Baptist, Congregational, and Non-denominational backgrounds, it is very common for the altar-like table to have on it only an open Bible and a pair of candlesticks; it is not referred to as an "altar" because they do not see Communion as sacrificial in any way. Many of these groups use a very simple wooden table, known as a Communion Table, adorned perhaps with only a lengthwise linen cloth, again to avoid any suggestion of a sacrifice being offered. Such Communion Tables often bear the inscription: "Do This in Remembrance of Me", which they believe indicates Holy Communion as being a memorial rather than a sacrament. Such a table is normally not consecrated or blessed in any manner, and may be temporary, being moved into place only when there is a Communion Service. Some Protestant churches have no altar or Communion table, even if they have the practice of the "altar call". or at most bring in a Communion table when needed. St Andrew's Anglican Cathedral in Sydney "wheels its altar in as if needed". The sanctuary may be dominated only by a large, centralized pulpit or there may be no pulpit as in old Quaker meeting houses. Having or not having a Communion table was a subject of dispute within Scottish Presbyterianism in the 17th century, with the Independents opposing its use. Some evangelical churches practice what is referred to as an altar call, whereby those who wish to make a new spiritual commitment to Jesus Christ are invited to come forward publicly. 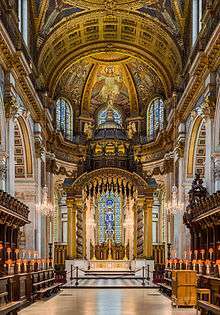 It is so named because the supplicants gather at the altar located at the front of the church (however, the invitation is referred to as an "altar call", despite the fact that most Protestant denominations which have this practice do not have altars or Communion tables). Most altar calls occur at the end of the sermon. Those that come forward will usually be asked to recite a sinner's prayer, which, in the Protestant understanding, if truly heart-felt indicates that they are now "saved". They may also be offered religious literature, counselling or other assistance. Many times it is said that those who come forth are going to "be saved". This is a ritual in which the supplicant makes a prayer of penitence (asking for his sins to be forgiven) and faith (called in Protestantism "accepting Jesus Christ as their personal Lord and Savior"). Altar calls may also invite those who are already fully members of the Christian community to come forward for specific purposes other than conversion; for example, to pray for some need, to rededicate their lives after a lapse, or to receive a particular blessing (such as the Gifts of the Holy Spirit) or if they are called to certain tasks such as missionary work. Beginning with the Catholic Revival in the 19th century, the appearance of Anglican altars took a dramatic turn in many churches. Candles and, in some cases, tabernacles were reintroduced. In some churches two candles, on each end of the altar, were used; in other cases six — three on either side of a tabernacle, typically surmounted by a crucifix or some other image of Christ. "Altar" has a meaning in the Eastern Orthodox and Eastern Catholic churches that varies with context. Its most common usage does not denote the table itself, but the area surrounding it; that is to say, the entire sanctuary. This includes both the area behind the iconostasis, and the soleas (the elevated projection in front of the iconostasis), and the ambo. 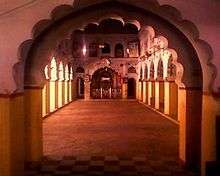 When one enters the sanctuary, one is said to be "going into the altar". The altar table itself may be referred to as either the Holy Table or the Throne (chu Prestól). This section will describe the Holy Table, not the sanctuary. For both Orthodox and Eastern Catholics, the Holy Table (altar) is normally free-standing, although in very small sanctuaries it might be placed flush against the back wall for reasons of space. They are typically about one meter high, and although they may be made of stone they are generally built out of wood. The exact dimensions may vary, but it is generally square in plan and in reasonable proportion to the size of the sanctuary. It has five legs: one at each corner plus a central pillar for supporting the relics which are placed in it at its consecration (if, however, the consecration was not performed by a bishop, but by a priest whom he delegated for that purpose, relics are not placed in the Holy Table). A plain linen covering (Greek: Katasarkion, Slavonic: Strachítsa) is bound to the Holy Table with cords; this cover is never removed after the altar is consecrated, and is considered to be the "baptismal garment" of the altar. The linen covering symbolizes the winding sheet in which the body of Christ was wrapped when he was laid in the tomb. Since the altar is never seen uncovered thereafter, the table tends to be constructed more with sturdiness than aesthetics in mind. Above this first cover is a second ornamented altar cloth (Indítia), often in a brocade of a liturgical color that may change with the ecclesiastical season. This outer covering usually comes all the way to the floor and represents the glory of God's Throne. In many churches it is the custom for a dust cover to be placed on the Holy Table between services. This is often a simple red cloth, though it may be made of richer stuff. Sometimes it covers only the Gospel Book or the front half of the Holy Table, but it may be large enough to cover the entire Holy Table and everything on it, including candlesticks and the seven-branch candelabra. The priest stands behind the altar and faces the people while praying mass in Maronite practice. Altars in the Alexandrian (Coptic) tradition must have a square face upon which to offer the sacrifice. As the standard Coptic liturgy requires the priest to encircle the altar, it is never attached to any wall. Most Coptic altars are located under a baldachin. In Ethiopian tradition, an icon is placed upon but towards the rear of the altar. It is away from the wall as in the Coptic tradition. 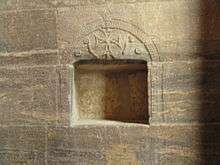 Altars of East Syrian Rite are similar in appearance to Armenian altars only they are not placed on a stage. Nearly all forms of Chinese traditional religion involve baibai (拜拜)--bowing towards an altar, with a stick of incense in one's hand. (Some schools prescribe the use of three sticks of incense in the hand at one time. ) This may be done at home, or in a temple, or outdoors; by an ordinary person, or a professional (such as a Daoshi 道士); and the altar may feature any number of deities or ancestral tablets. Baibai is usually done in accordance with certain dates of the lunar/solar calendar (see Chinese calendar). 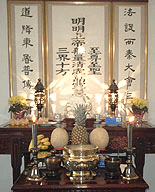 In Buddhism, a butsudan is an altar found in temples or homes. The butsudan is a wooden cabinet with doors that enclose and protect a religious image of the Buddha or the Bodhisattvas (typically in the form of a statue) or a mandala scroll, installed in the highest place of honor and centered. The doors are opened to display the image during religious observances. A butsudan usually contains subsidiary religious items—called butsugu—such as candlesticks, incense burners, bells, and platforms for placing offerings such as fruit. Some buddhist sects place "ihai," memorial tablets for deceased relatives, within or near the butsudan. Butsudans are often decorated with flowers. When the Japanese finally welcomed Buddhism after many years of Shintoism, they took in the religion along with the butsudan. As many new Buddhist sects came into being, the butsudan was placed in many temples. The Japanese took the plain walls and doors of the mainland shrines and elaborately embellished them, and the butsudan became the focal point of every temple. As time went on, people began installing butsudans into their homes. Butsudan are extremely expensive. In Nordic Neo-Pagan practice, altars may be set up in the home or in wooded areas in imitation of the Hörgr of ancient times. They may be dedictated to Thor, Odin, or other Nordic deities. Modern Neo-Druidism may also make use of altars, often erected in groves. Though little is known of the specific religious beliefs and practices presided over by the ancient Druids, modern people who identify themselves as Druids are free to incorporate their imagination in developing ceremonies and the use of ritual objects in keeping with their belief system. The "Order of Common Worship" of the Liturgy of the Druids  (New Reformed Druids of North America) calls for a fire to be started "in or near the altar" and makes use of various objecs such as a chalice, staves, and a plant offering. If no altar is used, the objects may be placed on the ground. The practice of worship on these spots became frequent among the Hebrews, though after the temple was built it was forbidden. Such worship was with difficulty abolished, though denounced time after time by the prophets as an affront to God. A closely related example is a "backyard" altar, so to speak. Before there was a set temple and an established altar people built their own altars. After the temple was built use of these altars was forbidden. Unlike the previous case, "backyard" altar worship was quickly eradicated. ↑ General Instruction of the Roman Missal, 299. ↑ James Begg, "A Treatise on the Use of the Communion Table, in Celebrating the Sacrament of the Lord's Supper"
↑ Isabel Hapgood. Service Book of the Holy Orthodox-Catholic Apostolic Church (Antiochian Orthodox Christian Archdiocese, 1975), p. 614. ↑ Liu Zhong. "Burning Incense and Worshiping Spirits". Daoist Folk Customs. Translated by Lü Pengzhi. Taoist Culture and Information Centre. Retrieved 2007-07-05. ↑ "high place". Encyclopædia Britannica Online. 2007. Archived from the original on January 5, 2008. Retrieved 2007-07-01.